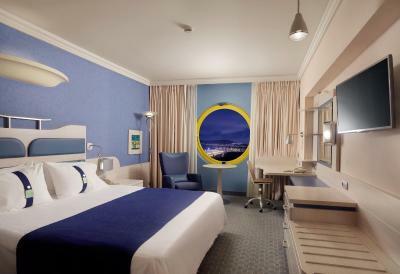 Hotel Holiday Inn Athens Attica Av, Airport W.
Lock in a great price for Holiday Inn Athens Attica Av, Airport W. – rated 8.2 by recent guests! Bathroom was roomy and lighting better than many hotels. We needed an overnight stay before embarking back to the U.S. The staff took care of us by making accommodations for our luggage as well as the airport shuttle. We appreciated the coffee and pastries in the lobby at 4 a.m. before the shuttle to the airport. Great value and service for our money. Great staff. Great accommodations. Easy trip to the airport. 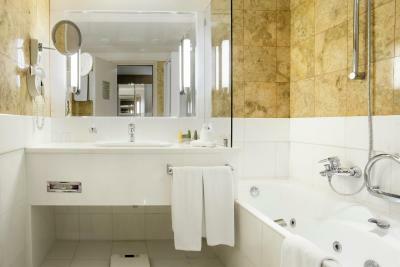 Large, modern room and bathroom with very comfortable beds. All amenities provided. Decent little dining room with basic menu for a light meal. Free shuttle van to the airport. We had a 6:00am flight so wanted to rest the day before. We had an excellent late lunch in the restaurant and took the 3:30 shuttle to the airport which is included. It was a long trip back to Los Angeles but we were rested and in the best shape possible for the trip. Definitely recommend this hotel. Super convenient location with free shuttle bus to the airport. The staff was very friendly and helpful. It was great to have the restaurant for a quick bite and a drink when we arrived in the evening after our flight back from Santorini. And the breakfast buffet was great. Very quiet for being so close to the airport. Staff is nice and helpful and room is clear enough! However location is a bit far away from the downtown because the airport area. We stayed at this hotel as it was close to the airport and we were only spending one night in Athens and then going to Mykonos. The hotel was very nice and restaurant food very good. Staff was also very good. Also provided free shuttle service to and from airport. It was incredible! The staff was amazing, so kind and helpful. I would have stayed longer if I could! Holiday Inn Athens Attica Av, Airport W. This rating is a reflection of how the property compares to the industry standard when it comes to price, facilities and services available. It's based on a self-evaluation by the property. Use this rating to help choose your stay! 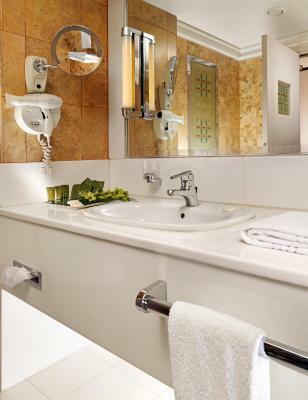 One of our top picks in Athens.Located close to the airport in Attica Avenue Highway, Holiday Inn Athens Attica Av, Airport W. offers stylish rooms with marble bathrooms and high speed internet. Guests enjoy free use of the gym, indoor pool and sauna. Eleftherios Venizelos International Airport is at a distance of 8.4 mi. The hotel offers a courtesy shuttle service from Monday to Sunday on a 24-hour basis. The shuttle bus operates every hour. Also, the hotel is just 0.9 mi from the suburban rail link. All rooms are air conditioned, and fitted with a satellite TV and video on demand. 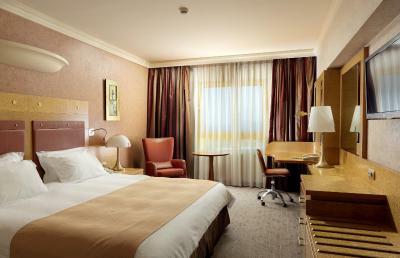 Each features an ergonomic desk with desk lamp, safe and complimentary coffee and tea making facilities. Guests of the Holiday Inn Athens Attica Av, Airport W. can start their day with a rich American breakfast buffet. A stylish open lobby featuring iMac computers, an interactive info bar and Play Station, gives guests the opportunity to connect, wine and dine at any time. The Ruby Restaurant and Golden Bar offer sumptuous meals and a wide array of drinks in a relaxed setting. Facilities include a 24-hour internet center, with complimentary use for 30 minutes per day. 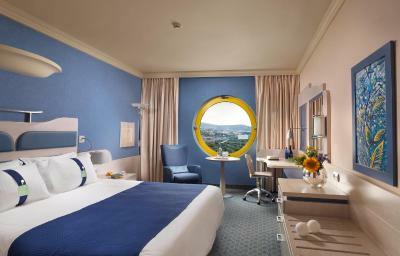 There are 6 flexible function rooms with Wi-Fi connections, which can accommodate from 10 to 200 guests. 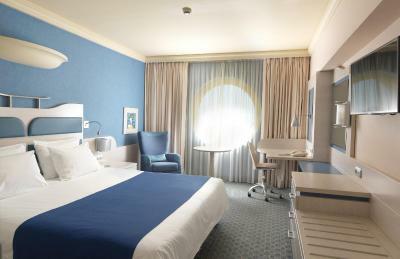 When would you like to stay at Holiday Inn Athens Attica Av, Airport W.? 5 reasons to choose Holiday Inn Athens Attica Av, Airport W.
An Inside Look at Holiday Inn Athens Attica Av, Airport W.
Holiday Inn Athens Hotel-Attica Avenue is located in Attica Avenue Highway, the new rapidly developing business district of Athens. 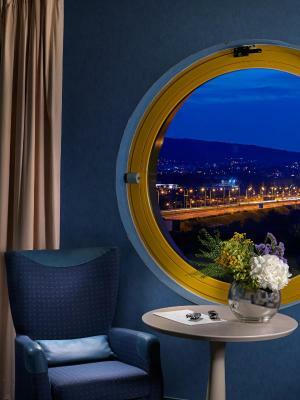 Our hotel is easily accessible from the Athens International Airport and the National Highway, and just a breath away from the suburban railway and the major exhibition centers in Athens. 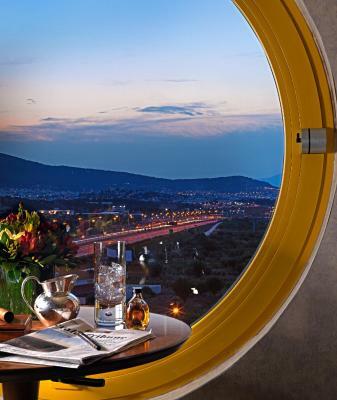 Holiday Inn Athens Attica Avenue is undoubtedly the best option for both corporate and leisure travelers when it comes to hotels near Athens Airport. Indeed the Holiday Inn Athens-Attica Avenue is one of the most popular hotels in Greece ideal not only for tourists and corporate travellers but also for sports teams, as it is just 10 minutes away from the airport and no more than 12 minutes from the Olympic Athletic Centre of Athens (OAKA), which is the home stadium of major sports clubs, such as Panathinaikos BC and AEK BC. You will be delighted with our hotel’s room amenities, while our fully functional business centre with 6 conference rooms and a capacity of 250 people proves to be the ideal destination for demanding business people and distinguished corporate organizations. 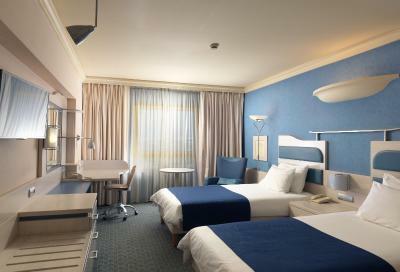 House Rules Holiday Inn Athens Attica Av, Airport W. takes special requests – add in the next step! Holiday Inn Athens Attica Av, Airport W. accepts these cards and reserves the right to temporarily hold an amount prior to arrival. -its terminal is located at the tourist buses parking lot on your right when you exit the Arrivals Building. See all guest reviews for Holiday Inn Athens Attica Av, Airport W.
Newest Reviews for Holiday Inn Athens Attica Av, Airport W.
the reception was cold and unwelcoming, the price is ridiculously high. Location. Good for a quick business trip. If more than that far away from everything. Location was wonderful as we came in from a late flight and and to travel onwards to Lefkada the following day. The room was expensive, although I guess it's close to the airport. Whilst it is in a good location for driving, it is effectively in a motorway service area so it might not appeal to everyone. I would be happy to go back when driving through Athens! Staff at reception and in the restaurant were friendly and spoke English. The rooms were a very good quality. The hotel is just off the motorway which means it is a great place to spend a night when driving to/from the airport. The restaurant staff could be a little more pleasant! Friendly, pleasant reception staff. The room was spacious, clean and comfortable. Very pleasant driver met us at the airport with the shuttle, think his name was Ilias. Warm, comfortable, clean and welcoming after a long and tiring journey. Plenty of choice for breakfast. Have been before and hope to stay again. Very comfortable, perfect. Airport service.